ChemSoft SDSM&D records which customers have been sent Safety Data Sheets and logs how the document was sent i.e. e-mail, fax or post. When a safety data sheet has been amended the system highlights those customers who need to be sent a new revision. Safety Data Sheets can then be manually emailed, faxed or printed from the software or using our automated dispatch modules, the software will take care of sending all Safety Data Sheets to your customers when required. When Safety Data Sheets are amended ChemSoft SDSM&D records those changes, issues a new revised document and archives the previous Safety Data Sheet. Archived documents can be reviewed by a system administrator at any time via the print manager. ChemSoft SDSM&D records all the Safety Data Sheets that have been sent to customers, the date they were sent, their revision number, the languages printed and also logs how they were dispatched. When a new revision to a Safety Data Sheet is available users can select to view and print the Issue Logs. These reports can be produced to show a list of all the customers that need to be sent one particular Safety Data Sheet or can be generated by customer, showing all the Safety Data Sheets that must be sent to one particular customer. Once new revisions have been dispatched via email, fax or post the systems logs are automatically updated to show that the new Safety Data Sheets have been sent. 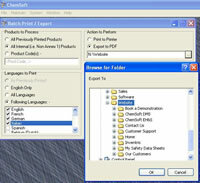 ChemSoft AM&D automatically dispatches Safety Data Sheets to customers. This module receives data from SOP (Sales Order Processing) systems and automatically sends Safety Data Sheets by email, fax to a printer for dispatch by post. Users may select any number of Safety Data Sheets (MSDS) to print or export to pdf at one time. You simply choose the products you require, select your languages and the software will either print all your Safety Data Sheets or create pdf files to any defined location.